Make every effort to avoid cancelling practices unless there are extreme circumstances. Scout out your neighborhood to identify covered areas; this includes 10’ wide covered walkways at buildings such as schools, etc. A productive practice can be run using a covered walkway. Most, if not all, of the activities below and be run on a concrete surface in a school yard. As you go through the list you will notice that few practice activities require good weather, a field or a diamond. Make it clear to parents that practices will not be cancelled because of wet weather. Included in this section are practice plans and templates for the first nineteen (19) practices of the year. These are organized so that each successive practice builds off the previous. A list with the sequence for introducing each skill and concept precedes the practice plans. A notation is made next to each telling which practice plan(s) the skill or concept is scheduled. Each activity in the practice plans is linked to a diagram or explanation of how the activity is run. At the end of the section are three 90-minute and three two-hour, mid-season, practice plans and templates. These illustrate the timing and structure of a practice after all foundational skills and concepts are in place. The content of practices from mid-season on will vary from team to team depending on which aspects of the game a coach feels their team needs work. These are designed generically for all 'Player Pitch' levels of baseball and softball. All teams will progress through the content at different speeds. It should not be a concern if your team requires a few extra practices to cover the content, On the other hand some teams can get through the content quicker, especially teams of 11-12 year olds. Note: while some of the content may seem elementary to a veteran coach it is important to make sure the kids are competent in each piece of content before moving on to more advanced activities. The practice templates in the Coaching Guide are based on the standard structure of a college baseball practice template; modified for the 12U environment. At the college level teams have limits to how much time they can spend on the field each week. Their practices are designed to maximize each minute the players are ‘on the clock’. The primary concern in the 12U environment is keeping the kids active and engaged throughout each practice. If we leave them standing and lose their attention and it is a challenge to re-engage them. Also, constant standing around (not having fun) is the primary reason kids leave the game. It is strongly recommended that kids who are early arrivals not play catch on their own. Don’t put balls out prior to the start of practice. Have half the kids batting and half chasing balls (they love this!). Give each player 8 swings then switch. Note: No ‘one mores’; doing this can eat up a lot of valuable time. If a player swings and misses on their eighth swing we tell them, “Good work. Switch to chasing balls.” Suggestion: tell the batter when they have two or three more swings. Make it crystal clear to the kids that running through, the pitching/swinging lanes of the activity is absolutely against the rules. They have to go around the outside. This is not as easy as simply telling them. It will take some time, and disciplinary action, to train them that there are no exceptions to this rule. Make it a rule that there is to be no swinging of a bat except when at the ‘plate’ and when a coach is pitching. Kids will want to pick up balls and try to hit them back to the coaches when picking up balls during or at the end of the drill. Be ready to squash this activity the moment it starts. Make it clear this will not be tolerated in any circumstance. The origination of Whiffle Ball Batting was to give the players something to do between their arrival at the ballpark and the official start of practice, so to not play catch unsupervised. However, since this is such a fun activity and is only available prior to the start of practice, it becomes an incentive for kids to arrive early. Ultimately this leads to practices starting on time with all or most kids ready to go. There are many activities that can warm up our players’ bodies, which at the same time develop baseball skills. Instead of running the kids across the park and back, take them through a series of activities that develop baseball skills. Many of the suggested activities for this part of practice rarely make it into a practice routine for many teams. Many of the more common skill building activities that make a the core of many practices, once learned by the players (and coaches), can be inserted into the Skill Building Warm-up portion of practice. This frees up more time to work on Team Play activities in the core part of a practice. The most important part of a practice is the Playing Catch Practice segment, traditionally referred to as ’Warming Up’. Unfortunately this has evolved into a lazy and sloppy activity. The ten minutes our kids spend playing catch should be the most focused, most intense and most disciplined part of the practice. This is the time when we as coaches have to be at our best, making sure each player is using proper catching and throwing technique. When the team is playing catch there needs to be an adult or two (coaches and/or parent helpers) standing behind each group of kids with extra balls in hand ready to resupply kids when balls get past them. The first few minutes of this routine the kids throw from approximately 35’ and work on pitching mechanics. The next few minutes throw from approximately 60’ emphasizing the proper stance prior to receiving a throw, footwork in preparation to receive a throw and proper receiving position. Examples of activities include, Skill Station Rotation, Cuts-Relays, Fly Ball Communication, Rundowns, Positional Responsibility Drills, Base Running, Mass Ground Balls and Fly Balls, etc. This activity is often characterized by one kid batting and eleven kids standing out in the field shagging. Those eleven other kids are often board and losing interest in the sport minute by minute. Batting Practice is a ‘12 Player Drill’ that is structured so that the entire team is engaged, active and developing skills throughout the activity. An entire section of the Coaching Guide is dedicated to describing how to set up and run an proper Batting Practice. This will be added very soon. ‘Kids sign up to PLAY baseball, not to practice baseball’. Kids do understand that they need to practice to develop their skills, but they also have a strong desire to PLAY. Our goal as coaches is to create a practice environment that is FUN as well as active, efficient and effective. It is strongly recommended that most every practice conclude with a scrimmage. A scrimmage is not a willy-nilly activity, however. This is a controlled activity where teaching takes place throughout. While the kids are having FUN PLAYING, the scrimmage serves as a great teaching and learning tool. Following each play, the coaches acknowledge things kids did correctly and instruct as needed. These teaching periods should be brief, 10-20 seconds; keep the game moving! Some of the content near the bottom of the list below will be moved to other areas of the site. The relevant information is that has numbers to the right of the drills and activities. The numbers indicate in which practice the drill or activity can be found on the 'Practice Plans' page. The purpose of this list is to provide a coach with a guide to which skills and concepts to teach first and a logical progression of teaching where each activity builds off those preceding. The ordering of the list can be debated; I have been rearranging it for years now, but am confident that, as it now stands, it is pretty solid. It is important to note, especially for coaches working with kids ages 10 and under, that introducing all the contents in the list in one season is not a goal to be concerned with; start at the beginning and progress with your team at a pace that they and you are comfortable with and confident. It is about a three year process for the players (and coach) to gain a somewhat solid grasp of the game, its concepts and skills. The information on this site is not intended to be consumed in one season. It is a 'guide' for a coach to follow year after year as they progress through the different levels of play. Beginner and novice coaches don’t need to be in a rush to get through all the content. Getting the kids solid in the basics (in the upper part of the list) will give them a good understanding of how to play the game and set them up to get accomplished players given their age. A veteran coach and coaches working with older players (10 and above) may move through the content quicker than is laid out in the practice plans. It is still important, however, to review and drill these players in the most basic content. Playing the game well and executing more advanced concepts will always be built off the most basic aspects of the game. The practice plans below are set up and paced for a mid-level player pitch team. These are to serve as a guide. A coach can deviate based on the pace their players pick up on the content, the coach's personal style and the specific needs of their team. These plans introduce content in a thoughtful sequence where each practice provides a foundation for the content taught in the next practice. Day 2 builds of Day 1, Day 3 builds of Day 2, etc. As practices progress into the season 'new' content will, in most cases, be a combination of concepts and actions the kids learned in earlier practices with one new aspect added. The practice plans alternate between a 90 minute schedule and a 2-hour schedule. Many younger teams only practice for 90 minutes; some older teams will go for two hours. There should not be any feeling that everything listed in a practice must be completed on that day. Just add the stuff you don't get to into the next days plan. Its not a race to teach the kids everything. Over the course of the season every team will progress through the teaching content at a different pace. Note: if we are successful in keeping our kids moving throughout our practices and recognize that the last 20-30 minutes of practice is a scrimmage, many kids (even young ones) will stay engaged for two hours AND want to practice for 2 hours. ...parents may have a different perspective and we need to keep that in mind when deciding to practice for 2 hours. The first four practice plans are posted. The content in the plans was covered in the Coaching Clinics and should be fairly familiar to those who attended. Some activities in the plans can be better understood given some supporting information. I will be adding this supporting information over the next few days (written March 5). 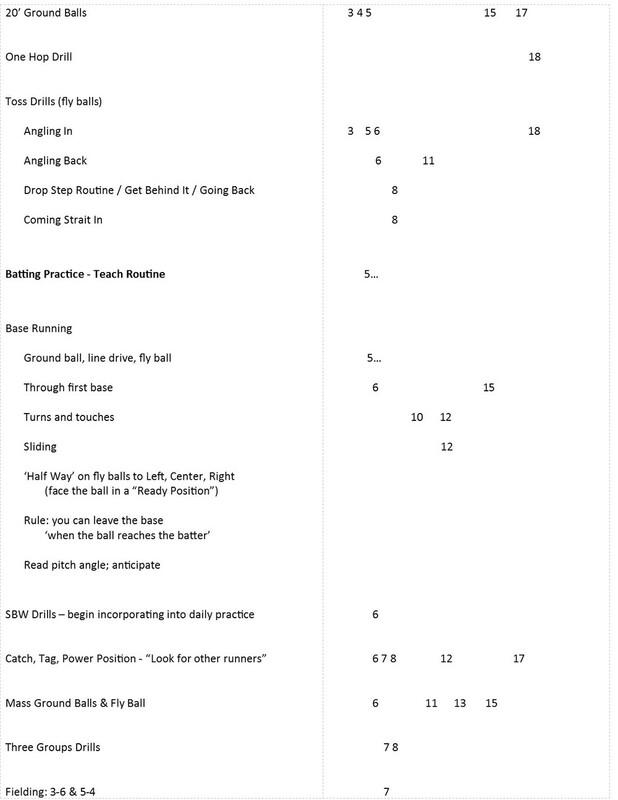 The next practice plan (#5) is 'Teaching and Learning Batting Practice'. the first four practices do not follow the Standard Practice Template. The objective of the first four practices is to teach the kids the foundational concepts of defensive positional responsibilities, throwing and basic pitching mechanics, the key focus points of playing catch (moving their feet to throw and catch), receiving throws at a base, fielding, a few simple skill building drills, etc. ...and of course - SCRIMMAGE! In many parts of the country we are still getting a lot of rain and most coaches will have to deal with wet fields from time to time, but that is no reason to cancel a practice. Short of lighting or a real heavy downpour we can still hold practice. The availability of, or use of, a diamond is not needed to run a championship caliber practice. Most of the activities in the practice plans can be run most anywhere, a gym, and outdoor covered basketball court, a covered walkway or in a school yard or parking lot that is free of cars. The parts of the practice plans that may need to be modified are batting practice and scrimmage. Use whiffle balls and shorten up the bases to 40'. At that distance the defensive players will get a decent feel of the ball coming off the bat, will have the opportunity to work on their footwork and see some fly balls. Give the kids the option of using their glove, however it is difficult to catch a whiffle ball with a glove, so encourage them to try defense with no glove. Split the team into two groups of six and set up two diamonds with two Batting practices going on at the same time. Four kids play defense and follow the same approach as described in "Batting Practice - A 12 Player Drill". The other two kids bat and work on reacting to balls off the bat. After the batter completes their swings they switch with the base runner. After they both get their swings, switch them out with two of the kids on defense. Again play using whiffle balls on a 40' diamond. The primary skills the kids are working on is base coverage responsibilities and footwork involved with covering bases, receiving throws at a base and fielding ground balls. 1. Execute their base coverage responsibilities. 2. Stop the runner. This is done by throwing the ball ahead of the runner. If there is any question the ball will reach a base 4-5 steps ahead of the runner, they instead throw a full base ahead of the runner. When the runner reaches their base and sees the ball being held by a defensive player at the next base there is no question the runner cannot run any further. To emphasize this fact the coach calls, "Time; rotate"
We have one batter, four infielders and a catcher. After the batter hits and runs the bases, all players rotate. The infielders rotate from 3b to SS to 2b to 1b to C; the catcher is the next batter and the batter-runner moves to 3b. Note: The catcher DOES NOT squat right behind home plate. Set a marker 10'-15' behind the plate where the catcher stands while the batter is swinging the bat. After the batter drops the bat, the catcher runs up to their 'position' a step in front of home plate. From there the Catcher works on their leadership and decision making skills by calling to the defense where to throw the ball. The catcher MUST were a helmet (to protect them from a flying bat), ideally one with a face guard. On the first day, like the first day of any new activity, this scrimmage format will be a bit wonky. Once the kids get the idea of 'get the runner out' out of their heads and grasp the concept of 'stop the runner', the drill starts running clean and fast. Expect to get 2-3 batters hitting and running the bases per minute. This format of scrimmage also gets the kids in tune to the idea that "The runner is safe a lot" in any baseball or softball game. But on each play we still must accomplish the goal of 'stopping the runner(s)'. Given this realization the kids begin to feel empowered by the act of stopping the runner. When it comes to real games, where the runner(s) is often safe, the players will recognize they have still accomplished something by 'stopping the runner(s)'. And not giving away bases by making poor throwing decisions resulting in overthrows and runners advancing further than they should have. IMPORTANT NOTE: When working on wet pavement it is important to remind the kids that it is slippery and in this situation they have to control their giddiness and move a bit slower and not try to stop and change directions. Note: we only run this drill with two groups the first couple of time (instead of three as shown in the drill diagram). There is too much going on with three groups; wait 'til the kids get accustomed to the environment before running the drill w/three groups. Coach pitches from 20’-30’, pitcher plays from rubber. (This is the introductory day and will take extra time to teach and get a feel for the flow of the drill. …until the defense forces them to stop after only going one base. – “Always move towards the ball"
It is important to prepare a written practice plan, with time designations for each activity, prior to every practice. This section provides the standard practice template along with six sample practice plans; three that are 90 minutes in length and three that are 2 hours. These examples are based on you and your players understanding the foundational skills, concepts and pace of activities (which is a result of having run through an activity 2-3 times). After getting through your first 10 practices or so, these will be useful. Right now they are helpful in painting a picture of what we are striving for in an efficient and productive practice. Note: 'parent helpers' can play a significant role in helping you develop their kids' skills. A key is to recognize that each practice follows the same pattern and flow. After looking at the practice plans, pick one and look up the drill diagrams for that single practice. Drill diagrams are sorted (or will be if not there now) by type i.e., 'Fielding', on their own pages in the Coaching Guide Folder. Note: It will take a few practices before the coaches, adult assistants and kids get a feel for the flow of the schedule. It is suggested that Batting Practice not be in the schedule the first 3-4 practices. This allows extra time for the other segments of practice to run longer while everyone gets accustomed to those. Whiffle Ball Batting Practice, which starts each day, gets the kids some swings. They also get some swings during the scrimmage at the conclusion of practice. Plan to set aside one practice, following those first few practices, and dedicate most of that day to teaching the batting practice routine to the kids and other adults. Explain the routine, set up the three groups. Run through the rotations slowly; continue to check to see that everyone, including yourself, is correctly going through the task for their spot on the field. Take the time to stop and correct and give direction as needed, so at the conclusion of the day everyone has an idea of what all players and coaches are doing at each point on the field during batting practice. Note: These are actually 90 minute practices with a 30 minute scrimmage at the end. Every practice must end in a scrimmage - "Kids don't sign up to practice baseball, they sign up to PLAY baseball"
Make it clear to parents that you have a rain day plan and that you have no plans of cancelling practices. When the season starts, skills often erode, at the time the kids are just starting to ‘Get it’. Parents Meeting: ‘Game Time’ begins at the start of Pregame Practice. Players are dismissed following postgame team meeting. …The first 15 minutes are batting; if your child is late they miss out on this opportunity. Parent Game Liaison is ‘go-between’ parents in stands and kids in dugout. Parents do not interact with their kids from the time they drop them off for Pre-Game practice until head coach dismisses players following post-game meeting. All interaction between parent and child during that time is limited to cheering during the game or via the parent liaison. …Exception is injury or illness. Always have a Written Plan prepared in advance, with time periods stated for each activity and defined assignments for each adult participating. Early on this will take some time, however as the season progresses a coach’s skills in preparing a plan will improve a great deal. Using the Practice Plan Template in the Coaching Guide will help cut down on prep time. Most practices vary little from on to the next. Often preparing a new practice plan is as simple as pulling out a couple activities and replacing them with new ones. There are not a lot of different ‘core’ activities. Over time the plans will start to look very much the same with just a few alterations for any given day. Do not allow players to chase missed throws (only in scrimmages). ;One of the biggest time wasters, if not the number one culprit, is kids chasing missed played balls during drills and while playing catch during practices. When a kid is chasing a misplayed ball, that player is not working on their skills. In many cases, when on player is chasing a ball, the result is many other players’ skill building activity also comes to a halt. Position adults where missed balls will end up. A key part of any effective 12U practice plan has adults assigned to spots on the field in relation to a given activity where balls are likely to be missed by a player. Those adults carry a handful of balls with them. When a ball gets past a player, an adult immediately flips them a new ball. Ideally each coach/adult has their own bucket for balls. A well-structured practice has multiple activities and involves quick transitions by the coaches from one spot on the field to another. When each adult had their own supply of balls, they just need to get their body to the right spot on the field; they have their most important tool with them – their personal supply of balls. Buckets can be used at the end point of a drill where players need somewhere to place the ball they were handling. Having a bucket of balls at the point in a drill or activity where balls are likely to be missed and players will need a ready supply of replacement balls. Important rule to establish on Day 1: “Dunks Only; No Jump Shots”. Immediately squash the players desire to see if they can ‘shoot’ balls into a bucket. This is major time waster and turns into chaos very quickly. Set down your bat and pick up balls using both hands --- no further explanation needed. Either you understand this statement or will figure it out after the first practice or two. Give a specific number when asking kids to pick up balls or equipment. When we say, “Ok, pick it all up” each individual sees ALL the balls or ALL the equipment and doesn’t recognize that the volume of items to pick-up is divided by 12. Instead say, “Everybody pick up five balls”, or “Everybody pick up two pieces of equipment”. Not only does clearly illustrate that their portion of the overall task is quite small, but because their portion is so small, their competitive juices often kick in and they will try to get five balls faster than their buddy; or try to get six or seven balls, so they can claim they got more than their buddy. Keep a supply of cones – the 8” disc style used by soccer coaches. The Mini-Diamond, which is used often throughout the season, is something that can be set up in seconds using cones. The younger the kids the more valuable the use of cones. Tee-Ball age kids should have a cone representing every spot on the field they need to stand. I would not hesitate setting them out on the field during Tee Ball games if the other coach would agree; and they would be crazy not to. Train/Discipline players to always RUN from spot to spot (establish concrete expectations and enforce them). Getting kids to transition quickly during between activities can add 10-15 minutes of skill building work each practice. Early in the season, invest the time to make individuals and the team (when appropriate) to ‘go back’ and transition again at FULL SPEED. Early on some practice time is lost to these disciplinary activities. This time investment up front will gain a team hours of effective work as the season progresses. Wiffle Balls - Indispensable tool for batting; they make it possible to practice hitting live pitches almost anywhere and anytime. These can be pitched to a batter straight on from a very close distance resulting in a higher percentage of good pitches to hit. They are safe, don’t fly far and can quickly be collected, so to get in more pitches and swings. They allow us to hold a batting practice in most any environment. ...No Field Assignment Required. Synthetic Balls - Used in wet conditions. Using leather baseballs in a damp climate is costly and a safety risk to kids. When leather balls get wet they become heavier and harder resulting in a ball that no longer plays like a good baseball. Effectively they are then no good for further use and have to be replaced. More importantly, the added weight (even after they have ‘dried’) puts a child’s arm at a much greater risk for injury. Synthetic Balls do not have a cloth component and resist water. They are also less expensive to purchase than leather balls. They play just as well as leather, given the age group we are dealing with. Save the leather balls for clear, sunny and dry days. Throw Down Bases - Same use as cones, but give a real feel when being used as a ‘base’ in a drill. Ideal to help build a MINI Diamond anywhere, anytime. Tees (for all age groups...including Major Leaguers) – These can be used every day during batting practice. Incorporate them into the offensive rotation with the next batter(s) in line to hit live hitting balls of Tees.